HubSpot: Can a Free CRM Platform Really Help You Grow Your Business? Customer relations management plays a crucial role in the success of any business. When a company spends time on building personalized relationships with their customers, then they will be able to better serve their customers, experience improvements in sales, and the business will also start to grow faster. With technological advancements, Customer Relationship Management suites have become the go-to options for small and large businesses to manage their customers, follow up on leads, process sales, and ensure customer satisfaction. These platforms are not cheap – they often cost thousands of dollars, which makes it difficult for smaller businesses to gain access to software that can help them better manage their business. HubSpot‘s CRM is currently one of the most popular systems that allow a business to manage their contacts and leads and comes with a convenient free plan. In this post, we’ll take a closer look at what this platform is all about, what it offers, how much it will really cost your business to use it, and we will consider what features the platform is currently missing. One of the best features that HubSpot CRM has to offer is the fact that you can get started without having to pay any fees. What’s more – their free plan isn’t a trial. You can access the majority of their features without having to choose a premium plan. As your company grows, you may require additional features – at this point, you can choose to upgrade your HubSpot CRM account to a premium option. All of these options come with the same features as the free account, as well as additional modules to help you grow your business and make your customers truly satisfied. Starter Plan ($50 per month, billed monthly) – Hubspot branding is removed, you get access to phone and email support, and you can create custom fields. Basic ($200 per month, billed annually @ $2,400 each year) – You get access to their blog creation tools, SEO tools, social media, and email marketing tools, as well as their landing page creator, an analytics dashboard, and you get 3,000 web sessions per month. Professional ($800 per month, billed annually @ $9,600 each year) – Provides access to the platform’s marketing automation tools, offers Salesforce integration, and gives you the ability to create user roles. Enterprise ($2,400 per month, billed annually @ $28,800 each year) – Offers custom revenue and event reports, event triggers, contacts reporting, company reporting, and an unlimited number of website sessions. When subscribing to a premium plan on HubSpot’s CRM platform, you also gain access to premium features on their other platforms, including the Marketing Hub and Sales Hub. HubSpot CRM is one of the many platforms that have been developed by the HubSpot team. It is fully integrated with their Service Hub, Sales Hub, and their Marketing Hub, allowing you to create a lead on one system and continue managing that lead on another “hub” or dashboard. The free plan offered by this CRM platform is enough to help any business get started and even offers an adequate level of features to allow larger corporations to manage their customer relations. 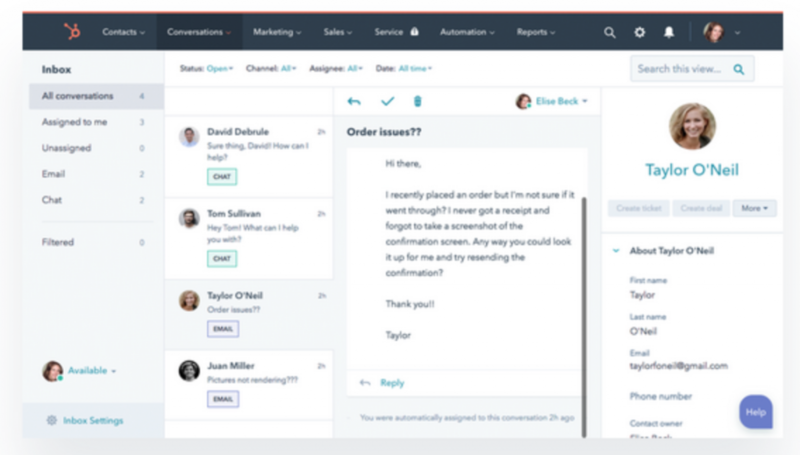 HubSpot CRM does not come with advanced customer support, but the platform does offer a complete series of training materials to help you get started and integrate the platform with your business. They do, however, offer live support for answering your basic questions. Communities have also been established where you can usually get most of your questions answered by an expert. If you need more advanced support through either email or a telephonic call, you will have to subscribe to their Starter plan, which comes with additional features, and access to their other premium platforms. 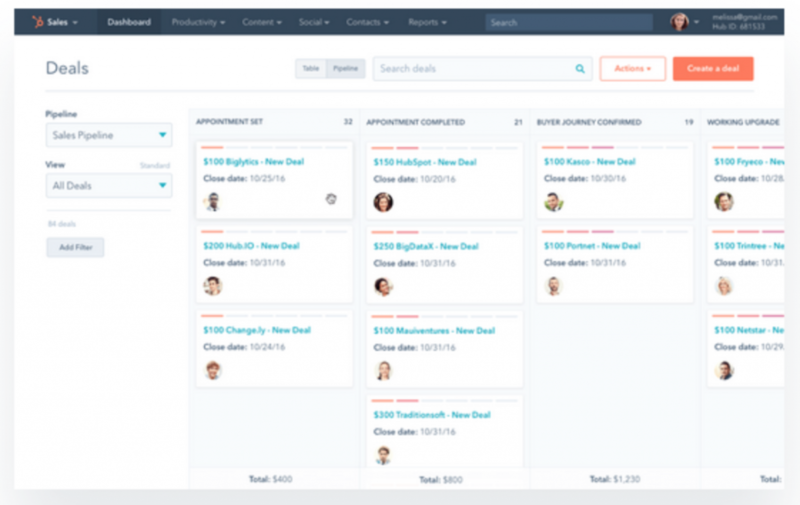 What’s missing in HubSpot CRM? While the features offered by HubSpot CRM are all great, we did find the mobile applications made available to those who want to manage their business on-the-go to be very restricted. A lot of the competing CRM platforms offer most features found on their desktop platform in mobile apps as well. With HubSpot CRM, only a limited number of features are available on the mobile applications. Businesses of all sizes can greatly benefit from the use of a CRM. HubSpot’s CRM offers your business the ability to get started with a 100% free plan, which offers various useful features that will help you manage your customers, process leads, and even schedule meetings. When the free features are not enough, a number of upgrade plans are available, starting at $50 per month, to help you get even more out of the platform.